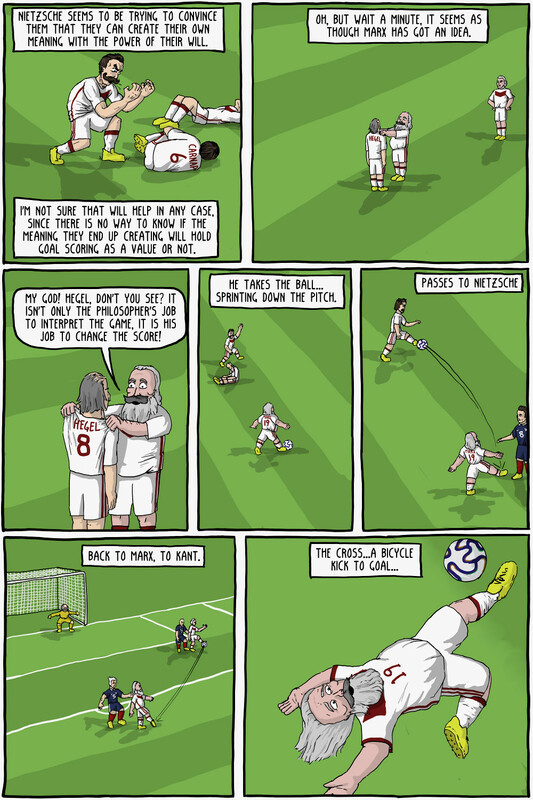 This comic is an homage (or perhaps ripoff, if you are feeling less generous) of Monty Python's classic skit, "The Philosophers' Football Match". 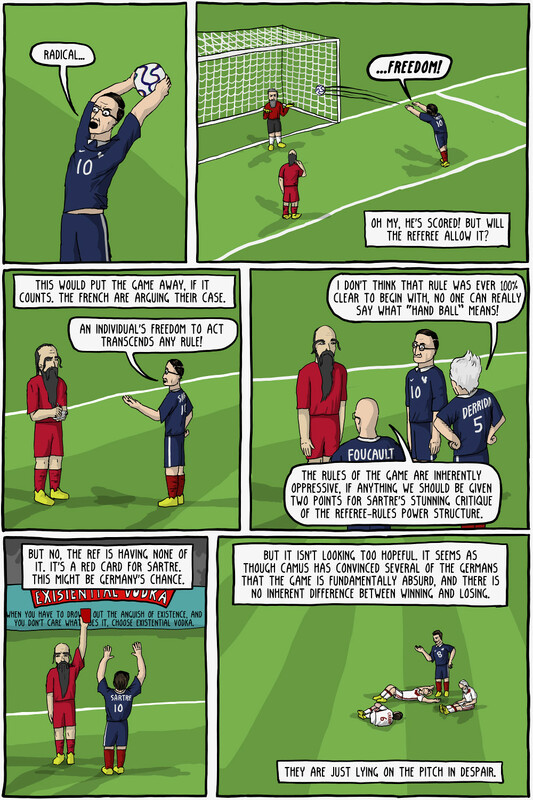 Sartre's "radical freedom" is explained in the notes on comic 17. Similarly, Derrida's joke is explained in the notes of comic 23. Hey, I have a limited subject matter, I'm going to reuse jokes, get used to it. Foucault was best known for his critiques of power structures, and for hyphenating words. Camus thought the world was "absurd". The contrast between the stark meaninglessness of the world and our forced meaningful narratives constructed around the events in our lives is what causes the feeling of the absurd. Nietzsche similarly believe the world itself had no meaning, but an individual could create meaning in his own life and exert it onto the world. Marx's line is a play on his famous quote "The philosophers have only interpreted the world, in various ways. The point, however, is to change it". Kant believed there was the "phenomenal world" (i.e. the world of appearances) and the "noumenal world" (i.e. the world as it really is). He said that we could never know anything about things as they really were. Heidegger's critique of technology said that it alienated us from our relationship with "being", which for Heidegger was paramount. Essentially (and grossly simplified) it comes down the common complaint that people have when someone is on their phone all the time instead of "experiencing life". The reliance on technology removes and abstracts us from living any kind of authentic life. Hegel was known for his dialectical method to philosophy, in which (roughly) there were three stages of an idea: first a thesis, which would give the idea. This would provoke its antithesis, which is what would negate the idea. By understanding the two, this would cause the synthesis of the two opposite sides into a more refined idea. This new thesis would provoke a new antithesis, and so forth, which is how we continually refine our ideas progressively towards the truth. KuhnCola is based on Thomas Kuhn's The Structure of Scientific Revolutions, which said that science was not merely the progressive collection of empirical facts, but would transition in larger scale "paradigm shifts" or "scientific revolutions", which were totally new theoretical overhauls of the way we interpret a certain phenomena. When this happens the scientists would have to reevaluate all of the data to fit the new theory's correspondence to the world. The most classic case is probably the transition between Newton's theory of gravity and Einstein's relativity. MarxCard is a play on the saying "From each according to his ability, to each according to his need", from Marxism. Dasein Coffee is a play on Heidegger's "Being-toward-death", which is a mode of being for the Dasein (i.e. human being). Essentially, it is authentically accepting one's own death. Existential Vodka is pretty self explanatory, the joke however was straight up stolen from Fallout 2, where there was an advertisement that said (from memory, many years ago, so it might not be exact) "Rotgut whiskey, when you have to drink something, and you don't care what, choose Rotgut". The unnamed philosophers were intended to be: Schopenhauer, Rousseau, and Voltaire in the first panel. 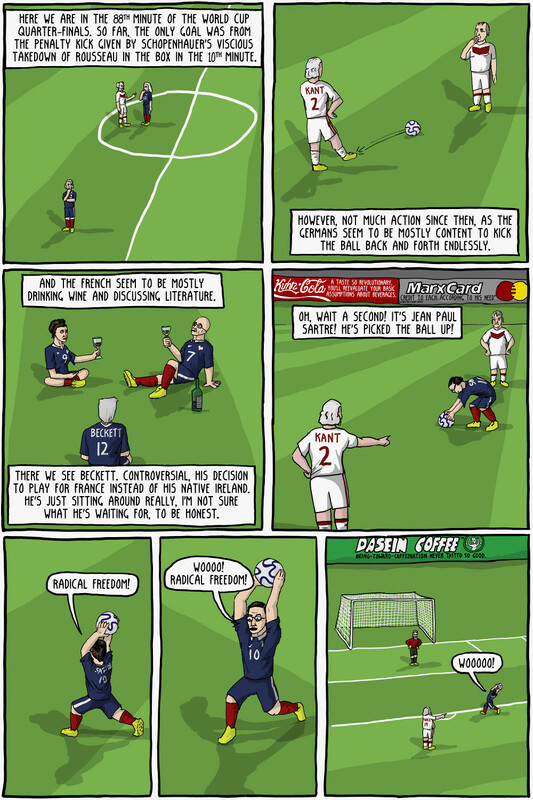 Actually, it was suppose to be Leibniz talking to Schopenhauer, but I accidentally drew him in a French jersey. Lucky for me pretty much every philosopher in those days looked exactly the same, so now he's Voltaire. Simone de Beauvoir is drinking wine with Foucault and Beckett. Frege is in goal. 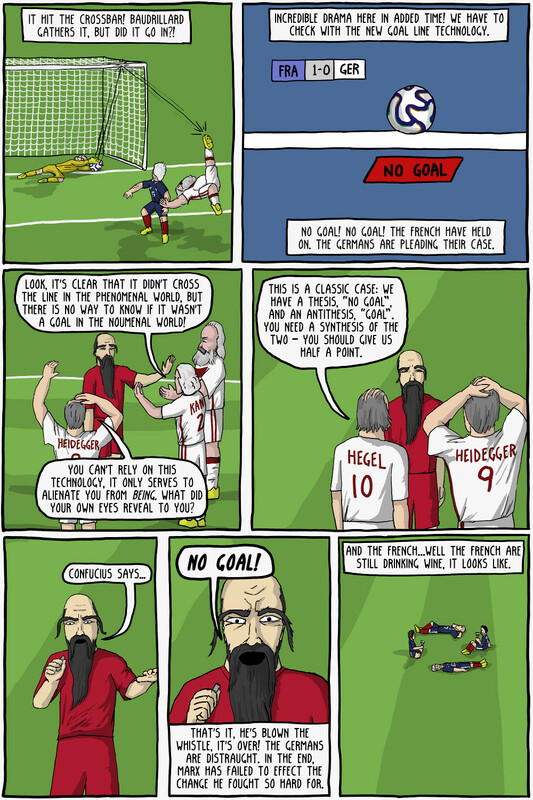 Schlick and Husserl are in despair.